Q: How can I make the networking process less awkward while still creating worthwhile connections? If you’re an introvert like me, the networking process can be a daunting and difficult scenario – both in-person and online. 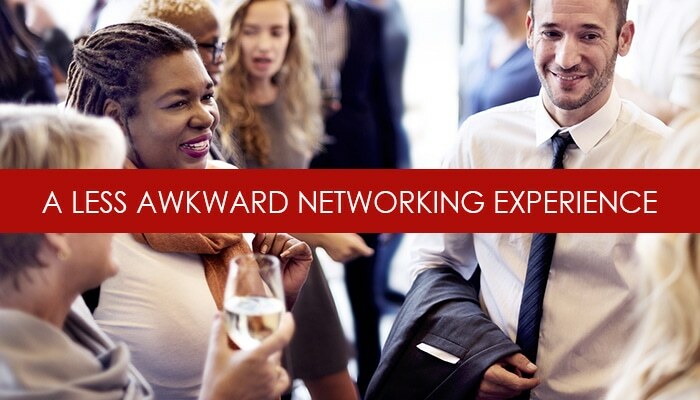 Trying to start a conversation and forge worthwhile connections at an in-person event is challenging, as is connecting and building rapport with someone through digital channels like LinkedIn. The key is in how you approach the situation and conversation. 1) Approach networking with a learning mindset. Go into the conversation or networking situation with a focus on learning about others. Providing someone with a platform to talk about themselves is a good way to take the pressure off, to feel less like you’re asking for their time and attention, and sets them up to ask you personal questions in return. 2) Listen for opportunities to be of service. When listening to someone speak about their personal or professional situation, zero in on areas where it sounds like they may be having a challenge, or where you can bring value to the table. Whether that’s providing them with a recommendation for a tool, offering to look at their resume, or perhaps making an introduction to someone they should know – being willing to help takes the pressure off of you, and creates rapport. And there’s a good chance they will be more open to returning the favor in the future. 3) Create an opportunity to move the relationships forward. Upwards of 80% of job opportunities aren’t advertised via public platforms like job boards or LinkedIn. The key to accessing this “hidden job market” is to leverage your relationships and connections – people who can alert you to new opportunities, and perhaps even help you get a foot in the door. Tags: job search, networking, professionalism. Bookmark the permalink.